Iconic comic book artist and writer Joe Kubert spent most of his life drawing brawny super heroes, lionhearted jungle men, and rampaging dinosaurs. But at age 75, Kubert began a journey back to his roots that led him to illustrate Warsaw Ghetto fighters, Holocaust survivors, and ethical mini-lessons for the Lubavitcher movement. Kubert, who passed away this week in New Jersey at age 85, left behind an enormous base of fans in the comic book world as well as a growing audience of admirers in the Jewish community. Kubert’s most recent phase was his immersion in his Jewish roots. While keeping up a heavy schedule of comic book illustration, he began making time for a number of Jewish projects. 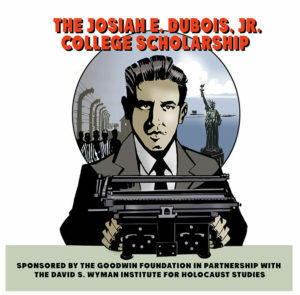 For the David S. Wyman Institute for Holocaust Studies, he helped design “Cartoonists Against the Holocaust,” a traveling exhibit of 1940s political cartoons from American newspapers about the Jews in Nazi Europe, and served as a judge in a student cartooning contest. For the Lubavitcher magazine “Moshiach Times,” he drew a series of two-page adventures with moral lessons, called “The Adventures of Isaac and Yakov.” He also wrote and illustrated “Jew Gangster,” a graphic novel about the Jewish underworld figures of yesteryear. The Jewish project that attracted the most attention was his 2003 graphic novel, “Yossel.” Comic book fans who were used to Kubert drawing the likes of Hawkman were startled to find their favorite artist recreating the Warsaw Ghetto revolt. “Yossel” utilized a “What if…” technique of storytelling familiar to comic book readers. In real life, Kubert’s family came to the U.S. from Poland in 1924 when he was a small child; in the book, the family stayed in Poland, and young Joe –Yossel– was a budding teenage cartoonist when the Germans invaded and World War II began. Yossel’s cartoons come to the attention of the Nazi authorities and his life is spared because his artwork amuses them. Ultimately Yossel chooses to join the Warsaw Ghetto uprising. Kubert was more than a little surprised when I called him in 2006 to tell him about Dina Babbitt, a cartoonist and illustrator who, like the Yossel character, was spared because of her art–in her case, Dr. Josef Mengele needed her to paint portraits of victims of his experiments in Auschwitz. “I had never heard of a real-life example of that [when I wrote ‘Yossel’]–I just imagined that it could have happened,” he told me. Kubert became one of the leaders of a campaign by the Wyman Institute to persuade the Auschwitz State Museum, in Poland, to return to Mrs. Babbitt eight of her paintings, which they have been holding. A petition he spearheaded netted the signatures of 450 comic book creators from around the world and international attention for Mrs. Babbitt’s cause.